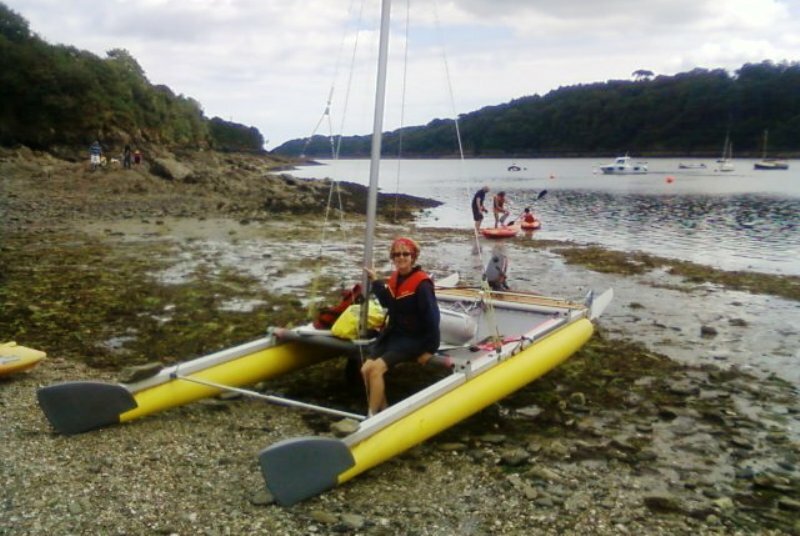 Well it�s been a great first year as a member of the Dinghy Cruising Association, and an exciting time sailing my new (to me) Catapult catamaran. In the past few years I have sailed extensively along the South West coast and even across the Channel with my friend Simon in his little Cornish Shrimper. I have had the sublime experience of sailing essentially all alone (Simon asleep below) under the stars, with only the distant flash of a light house to guide my way and the lights of an occasional fishing vessel as company. This year has been an opportunity to satisfy my desire to get back to some faster catamaran sailing and to lay down some plans to do some solo coastal trekking next year.Keeping safety at the top of my agenda (and I know enough of the sea to prepare well), I have been enjoying some short shake down cruises on the south coast. Some small modifications to the boat have been necessary to make it more suitable for cruising. Catapults are wet boats, so a wet or dry suit is essential and as such this boat is really only suitable for fair weather cruising. Fortunately the Catapult has a self-righting system so capsize can easily be recovered from. The hulls are inflatable hypalon, so swamping is not an issue. I have built an additional rear beam for the boat that allows me to have a small 2hp motor for work against the tide and even though the mast is buoyant, I have added a floatation bag at the masthead for safety. My first outing this year was to the Exe estuary, a beautiful sailing area I am very familiar with. My dear wife Victoria volunteered to come with me. It was a bright sunny day and we had a lovely sail up the estuary on the top of the tide. Catapult was performing moderately in light winds but picking up to exhilarating speeds when the wind freshened. I would clearly need to learn how to trim the boat better for light winds. A good fast beat back down to Exmouth on the falling tide but then we hit an unexpected problem. The tide was out about � of a mile from our launch point exposing the sands. I expected the sand but I hadn�t anticipated that the sand, which is firm underfoot, would not fully support Catapults wide plastic wheels. We had a real struggle getting her over the exposed sand banks. Still, a lovely day and a lesson or two learnt. Outing two was my first opportunity to get out onto the sea. I took Catapult down to Poole town marina with a view to sail her in some fresher winds. I wanted to cruise around Poole harbour, get out into Studland Bay and to try camping on board overnight in the marina. Poole harbour is lovely and I enjoyed some hours sailing gently around Brownsea Island. Out in Studland Bay there were heavy swells often due to the power boats making there way into and out of Poole. With a good breeze Catapult was sailing fast (given her cut down 8msq mainsail) and making 8/9 knots through the swell. I was initially apprehensive about Catapult nose-diving into a wave. Catamarans are sometimes prone to do that, but with my weight well back Catapult picked up as she hit each wave and my confidence soon returned. I was surprised too how safe Catapult felt to sail and I was easily able to ease off the power when I needed to. The down side to a fast boat is of course that you need to be alert all the time. When I needed to rest I could not heave-to as Catapult only has a main sail but just by letting go of the rudder and the mainsheet, Catapult sits perfectly comfortably on the sea while you enjoy a cup of tea. Over night at the marina didn�t go completely to plan because a kind skipper I know from the Poole Sailing School invited me to stay on his yacht. Got a good night sleep. Onboard camping will have to be my next test. Outing three was a couple of days sailing out of Brixham thanks to the hospitality of the sailing club there. Winds were poor, so I will say no more other than the local fish and chips were really good. Outing four was an opportunity to get down to one of my favourite sailing grounds, Falmouth and the Carrick Roads. Mylor marina happily provided me with a base and Victoria and I had a great day�s sailing in the Roads. Our next outing was an excursion out onto the sea and across the bay to the Helford River. We decided to make for the Ferry Boat Inn and set out across the bay in brisk winds and a comfortable swell. Catapult performed really well and we made good speed against the string of larger yachts making their way over to Helford. This was our first opportunity to sail to somewhere and what better place than the Ferry Boat Inn. Catapult safely pulled up on the beach we visited the pub for a nice lunch. It felt slightly odd at first, sitting in the bar in a wetsuit, but then another couple of local sailors came in wearing similar attire and I felt more relaxed. After lunch we left the Helford River and beat back up to Mylor in time for coffee at the marina caf�. Great sailing! The next step is a more ambitious coastal cruise and overnight camping on board.